Prince Albert Tobacco is one of the more popular independent brands of pipe tobacco in the United States; The blend is burley-based and remains one of America's top-selling pipe tobaccos. The tobacco was personally named by R. J. Reynolds after Edward VII, who was known as Prince Albert before being crowned King. The traditional Prince Albert tobacco in the red package. There is nothing else like it. The Prince Albert you buy tomorrow will be exactly the same as the Prince Albert you buy today. That's because strict standards are adhered to in the selection and curing of tobaccos that go into Prince Albert. Prince Albert's pipe tobacco is available in 1.5 ounce pouches and 14 ounce tins. The unique blend of Prince Albert Pipe Tobacco is achieved by adhering to the very high standards we set in every step of production. The attention and care paid to selecting and curing our tobacco equals that of blending and finishing. 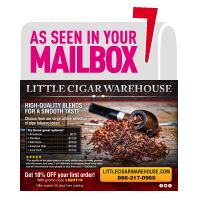 You will love the mild taste of this crimp cut and long burning pipe tobacco. Enjoy it's pleasant aroma as it fills the air. Tins from the Prince Albert brand are exceptionally common and nearly any version of a Prince Albert tobacco tin can be found at our store with very nominal price.